It's holiday shopping season again, and time to explore the trends and new possibilities in portable electronics and associated accessories. And now for something different in earphones -- the AirDrives "Outer-Ear" Stereo Earphones. These don't insert into your ear like earbuds, or cover your ear like headphones -- instead they hook over your ear, with the speaker hanging outside your ear. The result is an eye-opening (to mix metaphors) and somewhat more natural sound, like you are listening to outside speakers. While the experience is not as intense or as focused as sound literally plugged into your ears, the AirDrives provide a very comfortable and pleasant way to listen and enjoy. - You can remain aware of your surroundings, since your ears are not covered or blocked. The AirDrives are recommended for activities like jogging, when you really don't want to be oblivious to near-by cars. And they're great in the office or around the home when you need to be responsive to visitors. However, they obviously don't work well for activities like travel on airplanes and trains, where you may well prefer sound isolation and noise reduction. Since the AirDrives are open, the sound also can be heard by people near-by, which is a problem unless they're friends with the same taste in music (and even then when you're listening to an audio book). - They're comfortable for long-term wear, since they're just hanging on the ear, and not squeezing against your head or rubbing in your ear canal. The AirDrives have molded ear grips that are adjustable, and described as durable and water resistant. They also work fine with glasses. - The AirDrives are also promoted as good for helping to avoid possibly damaging decibel levels, since they do not plug up the ear and hold in the sound. The product design has some additional nice features. There's a very small control on the cord with a volume slider, especially convenient for quickly muting the sound. And they have a sliding cord joiner that can pull the left and right cables together for easier storage. The AirDrives were released in October 2007. 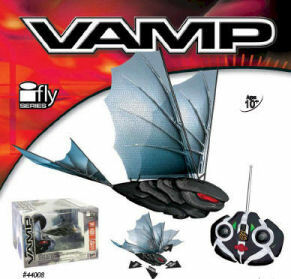 They were developed by InAir Technology, which was acquired in 2006 by Mad Catz Interactive, makers of interactive entertainment peripherals, including the GameShark line. They are available in two versions -- the standard model, black with silver earbud for $99.99, and a smaller / Kids model in white for $69.99. Computers are for work, and for play -- "lean-forward" to engage in focused work, and "lean-back" to relax and enjoy entertainment. But we do both of these activities on the same machine, so we need interfaces that supports both kinds of usage models -- a keyboard and mouse for desktop use and a remote control for living room style fun. Yes, you can try controlling a computer from a chair by taking a wireless mouse off the desktop and running it on your pants leg, but the result is a rather unsatisfying experience. Instead, the Logitech MX Air Cordless Laser Mouse breaks free into the air -- you can use it on the desktop, or hold it free in your hand and use gestures to control your computer, especially for playing media clips. The MX Air Mouse is a single device that fits both usage models: desktop and remote control. It's a desktop mouse with high-precision laser tracking, designed to work on most high-gloss surfaces. And it's a handheld, off-the-desk navigation device designed especially for digital media enthusiasts, with built-in support for common functions like skipping through clips and adjusting the audio volume. The tagline for the MX Air is "On the Desk. In the Air," and the statement couldn't have been more true. The design is slick black and silver, very elegant, even when just charging (it reminded me of those "Kone" Dirt Devil vacuums that are exhaustingly advertised on television for being beautiful enough to sit out on a coffee table). The mouse sits dark until you move it, when neon orange lettering illuminates to mark the functions of the six button buttons and the motion-sensitive scroll panel. The MX Air starts with the expected usages of a standard mouse, with a few perks. Logitech has addressed two of the main uses for computers nowadays, the Internet and media, and equipped the MX Air to help with both. It has a Back button for Internet browsers, as well as Play/Pause and Volume buttons that are designed to work with media players. The scroll panel is a motion-sensing strip that scrolls at different rates when swiped by a finger (with a simulated clicking sound -- a really nice touch). The true beauty of the MX Air is where it gets is name -- when lifted off a flat surface the mouse becomes like a remote control. The cursor on your computer screen follows the direction you point with the mouse (something like the Nintendo Wii remote). To make holding easier, there is a Select button on the upper center of the device which is comfortable to click while still holding the device like a remote. Then the MX Air adds nice perks with gesture controls like volume control. If you're listening to a song on your PC, but are sitting on the other side of the room, just hold the Volume button and move the mouse to the left or right to lower and raise the volume. You also can imagine using the MX Air for a slide show or PowerPoint presentation, though you may need to tweak the sensitivity of the buttons and scrolling to fit your clicking style. The accuracy is quite good (though it did take a while to really get used to it). It can take some time to steady your hand to click on very small icons or links, though again you can adjust the movement with the Logitech software. But the bottom line is that the Logitech MX Air Mouse is quite an impressive and fun tool that really changes how you can use a computer. 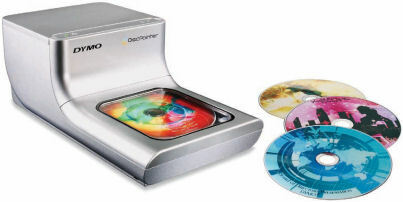 It was released in August 2007 for $149, and is now available for around $129. I've been a big fan of the RCA Small Wonder line of digital camcorders (see earlier post) -- they're simple, and fun, and compact, and dead easy to use, especially for shooting quick Web videos to upload and share. 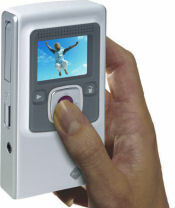 And now there's more options along this line from the company from which RCA licenses the design -- with the Pure Digital Flip Video camcorders. 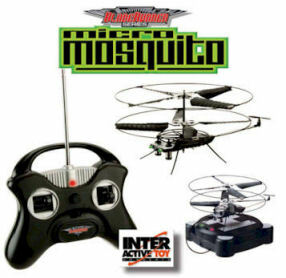 Everything is included: they run on two ordinary AA batteries; operate with simple controls to record, review, and delete clips; connect to a PC with a built-in pop-out USB connector; and even include onboard software (for Windows and Mac) to edit and share your clips. And they shoot presentable VGA-res video (640 × 480), at full rate (30 fps), using MPEG-4 compression, and saved as an AVI file. 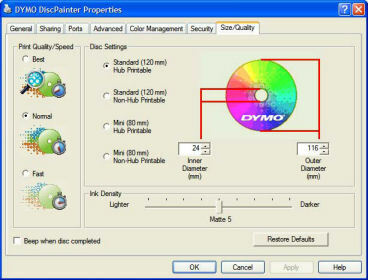 You then can use the built-in software, or other recent consumer software, to play, edit, convert, and share these clips. 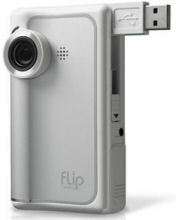 The Flip Video, released in May 2007, goes even simpler and smaller than the latest RCA Small Wonder design, by eliminating the flip-out viewfinder and memory card expansion slot. It's available in a 30-minute model for $119.99 (512 MB), and 60-minute for $149.99 (1 GB), in white and black. And the newer Flip Video Ultra from September 2007 adds a no-glare viewfinder and beefs up the video quality (from 2.8 to 4.5 Mbps). It's available in a 30-minute model for $149.99 (1 GB), in white and black, and 60-minute for $179.99 (2 GB), in white, black, orange, and pink. 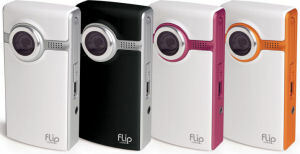 The Flip Video Ultra also adds an enhanced video processing engine to improve the color fidelity, exposure control, and dynamic range, plus a built-in tripod mount. And it improves the battery life from 2 to 2.5 hours (Alkaline), and 5 to 6.5 hours (Energizer e2). Tired of all that manual messing around whenever you want to get photos from your digital camera -- Bring the camera back to the computer, dig out the necessary cables and docking connectors, fire up the photo software to upload the files, and then shutdown and disconnect the camera. The Eye-Fi Wi-Fi-enabled SD card ends all that fuss. It's a standard SD memory card with built-in Wi-Fi wireless networking, so it can upload your photos whenever you are in range of your home wireless network. The Eye-Fi SD card works with many models of digital cameras, with 2 GB of storage for your photos. It was released in October 2007, and is priced at $99. Shooting photos of small objects is tricky, for example for posting on auction websites -- Unless you have a photo studio available, you're always challenged to get good lighting, fighting shadows and glare, and struggling to position and stabilize the camera. The Merax One Shot Photo Studio is a nice solution for photographing these kinds of items. It's a portable photo studio / light box for around $99 -- a 16 x 16 inch box of translucent white nylon walls that collapses into a slim carrying case. The product includes the other pieces you need for a portable photo studio: two small lamps, a camera stand, reversible background cloth, and software for background removal and editing. The high-output lamps with 6 inch stands can be handheld, or set them on the pop-out 4 inch retractable tripod legs to illuminate though the side walls while reducing shadows and glare. Then position the camera stand, with a 10 to 17 inch adjustable pole, set on a heavy steel stand. The product ships with minimal instructions, but it's really obvious and easy to unfold the walls and assemble the box -- the edges stick together with Velcro fasteners. The non-reflective background cloth hangs down for the back and floor (so there are no hard corners in the photo), and is reversible (white or blue). The Merax Photo Studio product also includes ArcSoft PhotoStudio software for photo editing, with the Cut-It-Out plug-in for background removal -- just brush roughly over the foreground and background areas. When you are done, just fold up the walls into the integrated protective case, around 17 x 17 inches. The front of the case even includes three pockets to store the lamps and camera stands. Then pick up the handle and move on to your next shot. Another fun photo accessory is the Merax Mini USB Strap -- it's a wrist strap with integrated Mini-USB cable, for around $10. The strap is the thin plastic USB cable, which loops to a length of around 5 1/2 inches (a tad small for a big hand). The strap loops through a small plastic box that protects the connectors. Then to use the cable, slide off the plastic end, and pop out the two connectors -- USB to mini-USB (it takes a little dexterity to wiggle them out). Then extend the cable to about 12 inches. That's it -- Now you can carry a USB cable along with your camera (or other portable device), disguised as the wrist strap. 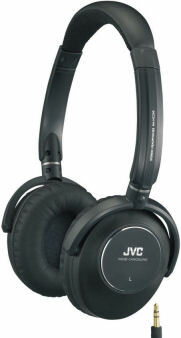 The JVC HA-NC250 Noise Canceling Headphones are JVC's new top-of-the-line model ($199 list, $139 street price) -- both with better performance and better comfort than the earlier HA-NC80 model. The headphones wear comfortably for long periods with the soft "memory foam" ear pads. The oval earpieces have a double housing structure with extra sound insulation layer, so they do a better job of sound isolation to begin with, blocking outside sounds. You can use the headphones stand-alone (with no audio playing) to quiet your environment -- the 4 foot cord uses a standard audio jack and detaches from the headphone. And you can use them as regular headphones, without the noise reduction circuitry enabled. For noise reduction, the NC250 features new feedback technology, rated to eliminate up to 85 percent of extraneous background noise (speced as >16.5 dB at 150 Hz, compared to up to 75 percent with the earlier NC80, or >12 dB at 300 Hz). 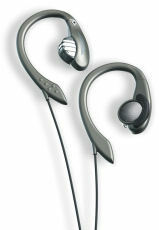 The NC80 also has a switch for two noise cancellation modes ("wide" and "low"), which is omitted in the NC250, since the technology has improved. We first tried the NC250 stand-alone, without playing any audio through them. Turning on the noise reduction clearly reduces the background room tone, particularly at the low end. For example, it significantly lowers (but does not completely eliminate) fan noise from computers. Then with music, the NC250 again reduces background sounds. However, the technology also slightly boosts and shapes the sound, so you can't make an exact A/B comparison. We did detect a very slight distortion in certain passages, such as a quiet piano piece when the sound swelled, although this was noticeable only with a trained ear, and nothing like this was heard with louder music. The NC250 is designed for travel, at 5.3 ounces. It folds flat (the earpads twist), to fit in the included hard case. However, it doesn't collapse quite as far as the NC80, which has foldable arms to tuck the earpieces into the headband. The product also includes airline and phono adapters. The NC250 is powered by a single AAA battery, which is inserted by removing the right earpad (the same side as the noise cancelling On/Off switch). The headphones are rated to run 50 hours with an Alkaline battery. The HC250 uses a 40mm neodymium driver in each earpiece, for a wide frequency response (8 Hz - 24,000 Hz). While they don't have the flatter response of more expensive professional units, they provide good sound, nice comfort, and effective noise reduction. Entries posted to Manifest Tech Blog in December 2007, listed from oldest to newest.